Martin Jones played well enough in Game 1 to give the Sharks a chance to win the game. In stopping 28 of 30 Pittsburgh shots on goal in Game 2, he played well enough to steal the game. 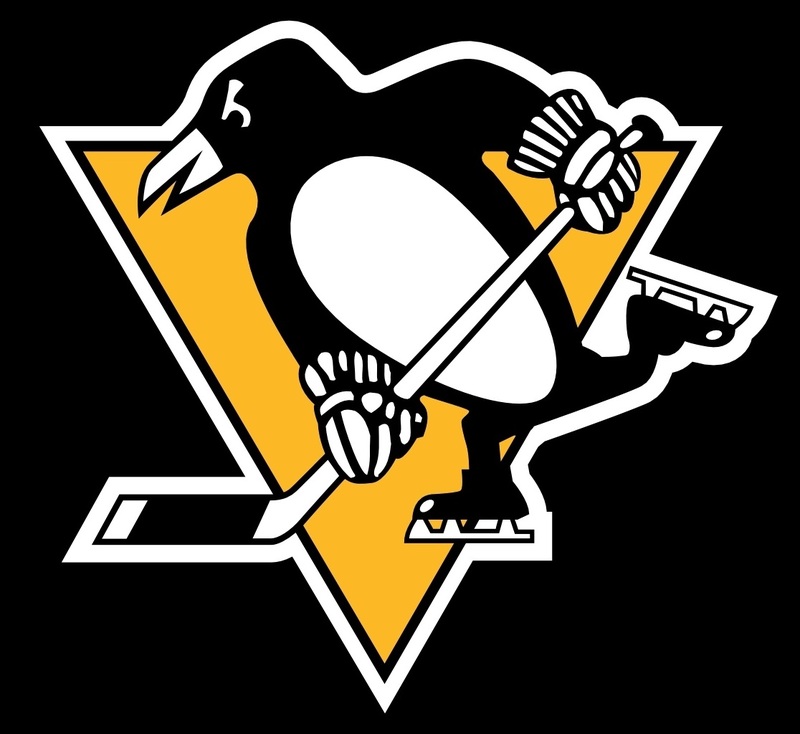 However, the Penguins shut down the high-powered San Jose offense with aggressive play and a great possession game, and the Pens were able to do what it took to leave Pittsburgh with a 2-1 win and a 2-0 series lead. Phil Kessel and Conor Sheary got the goals, while Matt Murray stopped 21 of the 22 shots he faced. One of the big questions heading into Game 2 was how the teams would respond after a Game 1 that saw both teams control play for long stretches of time, but the 1st period looked awfully similar to the previous game. 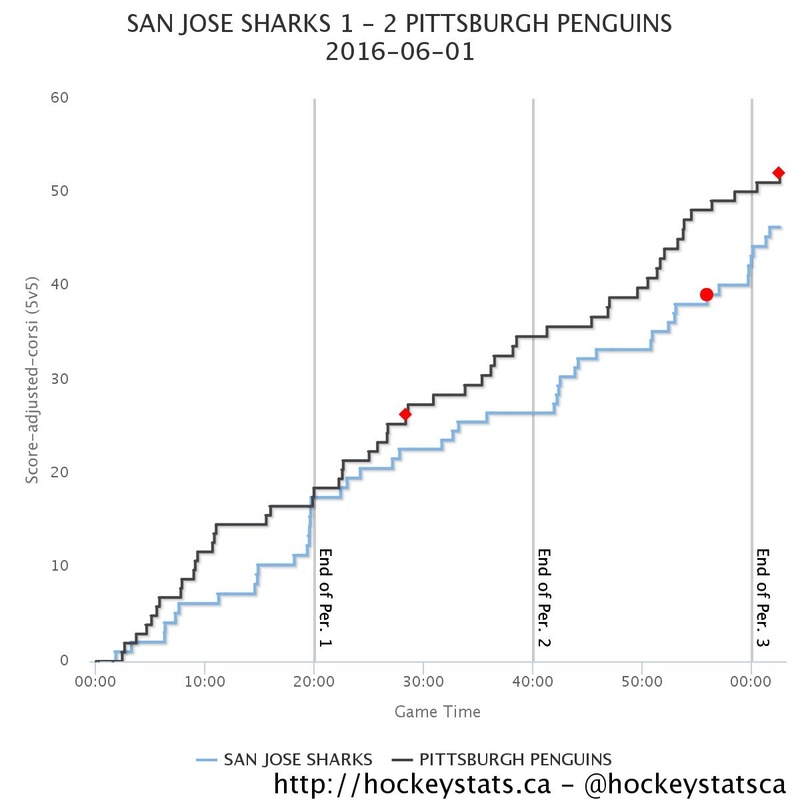 After both teams felt each other out in the first few minutes, Pittsburgh would start tilting the ice towards the San Jose end of the rink, and they would have several great chances that could have led to the opening goal. An Evgeni Malkin shot ricocheted off players and front and trickled just wide of the goal. Chris Kunitz rang a shot off the post. Sidney Crosby made a great no-look past to Patric Hornqvist in the slot, but he couldn't elevate the puck over Martin Jones' left pad. The Pens would get a break later in the period when Paul Martin cleared the puck over the glass from the corner behind the Sharks' net, but the Pittsburgh power play would look out of sync and be incapable of generating much of a threat. Neither team would be able to get the puck past the other's goaltender, and the period would end with San Jose having six skaters on the ice that went uncalled by the referees. The teams would enter the dressing room still scoreless, and the Penguins would be looking to avoid the 2nd period let down that plagued them in the first game of the series. The Sharks would have a great chance to take the lead early in the period when Tomas Hertl nearly put the puck into the net on a wrap around while falling to the ice, but the puck went off the post and bounced away. 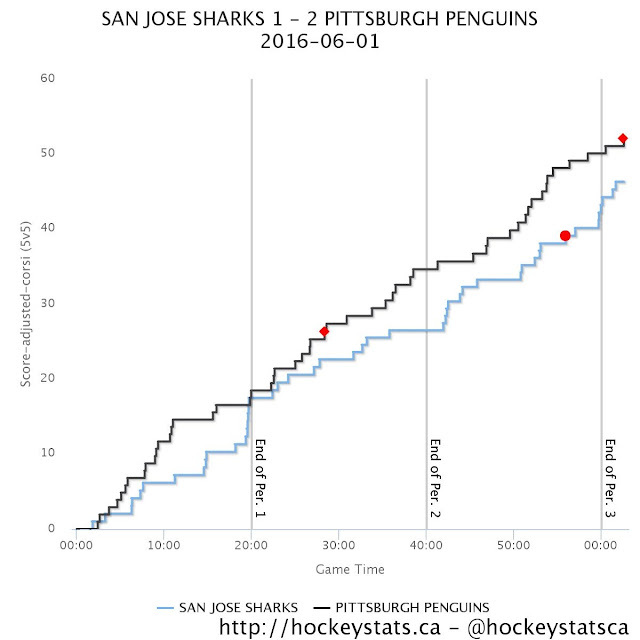 But it would be Pittsburgh who would grab the lead midway through the period off some great forechecking. Carl Hagelin forced a poor pass by Roman Polak in front of the San Jose net that Phil Kessel nearly picked off on the doorstep of the goal. The puck came out to Brenden Dillon, and Hagelin raced across the zone to take it off him and feed Nick Bonino streaking down the slot. Bonino got Martin Jones to go down, and he wrapped a pass around the goalie that deflected off Polak, and Kessel put the puck in the net as it bounced towards the goal line. The HBK line would have a great chance later in the period as Hagelin corralled a loose puck to start a 2-on-1 rush with Bonino, but his shot rang off the crossbar and out of play. Late in the period, Logan Couture would flop to the ice to draw an interference penalty on Ian Cole, and the San Jose power play would take the ice. But the Sharks wouldn't be able to get a goal before the buzzer, and the teams hit the second intermission with the Penguins holding onto a 1-0 lead. The Sharks would need to pick up their play in the final 20 minutes, as they managed only 11 shots on goal during the first two periods while Pittsburgh thoroughly controlled the gameplay. San Jose would start the 3rd period with a brief power play, but they weren't able to convert and Cole exited the box to return the teams to 5-on-5 hockey. The period would be full of close chances on both side. Cole would deflect a centering feed just wide of the net. Chris Tierney got behind the defense, but he rang a shot off the crossbar. Kessel nearly had his second of the game midway through the period, but his shot hit off the post and bounced away. And though Pittsburgh was dominating the game and getting great chances, the one goal lead could disappear in the blink of an eye, and that's exactly what happened when a Justin Braun shot from the point went through traffic, off the post, and into the net. It was a huge goal in the final minutes of regulation for a San Jose team that hadn't deserved to still be in the game based on the play of their forwards, and it forced overtime with the teams finishing the 3rd period tied 1-1. Needless to say, the next goal would be huge for the series, as it'd either tie things up or give the Pens a huge 2-0 lead. And Mike Sullivan would be faced with a huge decision early in the period when the HBK line, after a long shift in the defensive zone, iced the puck and allowed the Sharks an opportunity to get a fresh change against their tired legs. He made the gutsy call to use his timeout less than two minutes into the overtime period, and moments later the Crosby line would hop over the boards and Hornqvist would crush Dillon behind the net. The puck would get trapped under him, and the refs would blow the whistle dead and drop the puck to the right of Jones. Crosby won the faceoff back to Kris Letang, and the blueliner made a nice pass to find Conor Sheary alone in the high slot. Sheary settled the puck, turned to face the net, and wristed the puck past Jones' outstretched glove to give the Penguins the 2-1 victory. The Pens got off to another strong start in the 1st period, and they'd turn that into a 1-0 lead in the 2nd period. San Jose would make a big push towards the end of regulation to tie the game, but Pittsburgh still finished with a score-adjusted 52.9 CF%. The speed of the Penguins has given the Sharks fits for long stretches of time, and it's a testament to Martin Jones' play in net that they've only scored 5 goals through the first two games. The teams will now travel to San Jose for Game 3, and just splitting the pair of games in the West would give the Pens a commanding 3-1 series lead with two of the final three games at home. And if they win them both? Well, they'll be celebrating the franchise's 4th Stanley Cup on the road for the 4th time.